Oyaide SRBN are extreme banana plugs designed with absolute care to detail, structure and texture to deliver what we feel are some of the finest banana plugs on the market. It's a simple thing a banana plug, but why shouldn't it be both beautiful and designed for the best sound. All elements of these plugs give an impression of quality and rigidity. From the beautiful guilloche pattern on the surface inspired by a luxurious Swiss watch, to the brilliant buff finished body, to the blue stainless steel screws which are reminiscent of clock hands, these plugs are the definition of a fusion of excellent sound and design features. The main body is trimmed from an 8mm phosphor bronze bar and then the insertion bit is slit up in a cross shape and divided in quarters to ensure maximum contact area in the terminal. The size was determined based on WBT speaker terminals, but it can be fit in any banana plug terminals. After more than ten times of repeated cut and try in micron scale, SRBN was exquisitely-designed to be inserted smoothly and not to be come off easily. The highly rigid 5mm stainless screw is used for the 4mm cable penetration part. This fills inside space between the body and the screw. 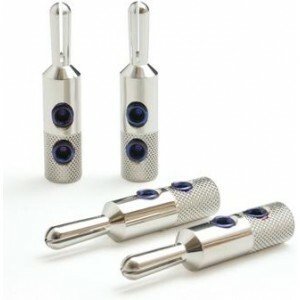 The blue screws, made of stainless with quench hardening treatment, are highly rigid and emphasize the beauty of SRBN. After careful polishing by hand and mirror finishing, the body is completed with silver inner and rhodium outer plating.